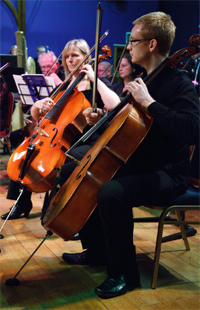 The orchestra rehearses on Sunday afternoons from 2.15pm until 4.45pm during the months of September to April. The venue is Wallneuk North Church, Abercorn Street, Paisley, near the town centre and easily accessible from both the M8 motorway and Paisley Gilmour Street Station. St James Orchestra is always pleased to welcome new members. No formal audition is necessary but previous experience of orchestral playing is helpful. We suggest that players, particularly string players, need to be of at least ABRSM Grade VI standard to get the most enjoyment from rehearsing some difficult works. The current annual subscription is £75, but students pay £20. There are no additional costs (eg for music, tutoring, etc). Members who pay basic rate tax are encouraged to Gift Aid part of their subscription. This increases the value of the subscription to the orchestra by 20% at no extra cost to the member.